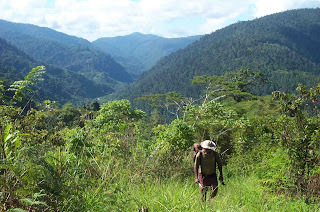 The old Black Cat Trail between Salamaua and Wau, Morobe Province, makes the Kokoda Trail seem like a Sunday arvo stroll in the park. 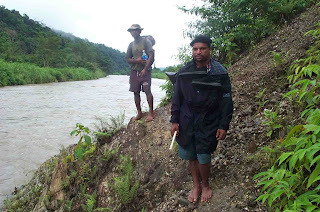 This is because it is not an established trail like Kokoda, on which hundreds of trekkers regularly tread, but a forgotten World War 11 course that passes through some of the toughest and most-hazardous terrain in the world. Leech and snake -infested jungle, moss-covered rocks and fallen tree stumps, precarious cliff crossings, and potentially-dangerous river crossings make the Black Cat arguably one of the toughest tracks in PNG and the world. 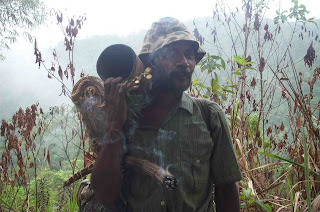 Should there be an accident, unlike Kokoda, there are no radios to call for a helicopter to come and evacuate you. 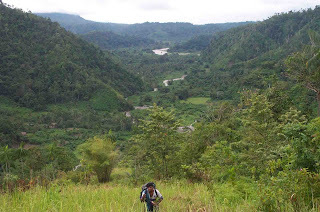 It is recommended only for the very-fit and experienced trekker. Some Australian soldiers have described the Black Cat as the hardest walk they’d ever done. The Lonely Planet guidebook quotes a local expat as saying the Black cat is “suitable only for masochists and Israeli paratroopers”. After walking from Salamaua from Wau over five days from July 22 tt 26 in 2003, I can only say know that I do not know how I survived. 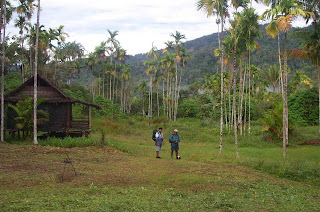 The idea of walking the Black Cat Trail came to me after my painful struggle over the Kokoda Trail in June 2003. The Black Cat has always fascinated me, since I take an avid interest in WW11 history, and that my mother is from the Salamaua area. In September 2003, Salamaua marked the 60th anniversary of its recapture from the Japanese in 1942. On Monday, July 21, 2003, we found ourselves heading down the Huon Gulf on board a 40 horsepower dinghy from Lae to Salamaua. Pouring rain eventually gave way to sunshine as we dropped off some students at Salamaua High School on top of Kela village, before crossing the bay to Laugui village at Salamaua Point. We spent a relaxing afternoon visiting the old graves around Salamaua, which date back to the gold mining days, as well as Japanese tunnels and anti -aircraft guns on the hill overlooking the isthmus. After that, we went to the new-look Salamaua Haus Kibung, which after many years of inattention is now getting back its glory. We checked into one of the chalets, which at K20 per person a night is quite a good deal, seeing that it comes complete with electricity, gas cooking facilities, and bathroom and toilet facilities. After dinner, we chatted well into the night with caretaker Mathew Gomuna, a cheerful fellow from Garaina and some of the locals. Mathew also lined us up with Lionel Aigilo, a young guy who would take us from Salamaua to Wau. Come Tuesday morning, heavy rain started pouring, and we had to wait until 10am before we left Laugui with Lionel and his hardy uncle Solomon Jawing. 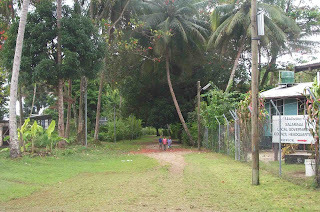 We followed the coconut avenues past the colorful cemetery, walked further inland through thick mud, where we crossed the flooded Francisco River. I found the going tough against the swift current; however, Lionel and Solomon were on standby in case I was swept away. 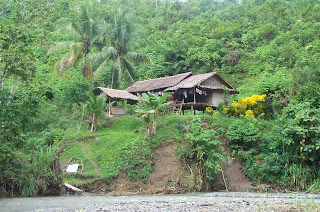 We walked through gardens, swamps, and creeks before engorging on a classic lunch of Lae Biscuit and Sita tinned meat, washed down with spring water, on the banks of the flooded Francisco. 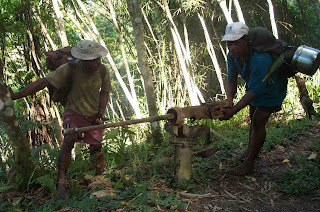 This was when the hard slog started as we climbed through thick kunai up towards Mount Tambu. Every now and then, we would come across shady bamboo, rewarded by panoramic views of the valley and sea unfolding before us. Massive bomb craters from WW11 indicated the ferocity of the battles here in 1942. Solomon recounted a story, which was repeated several times, of a Japanese assault of the Australian defenses in 1942. The Japanese were charged down by a huge masalai (spirit) pig, which ravaged them and forced them to flee. 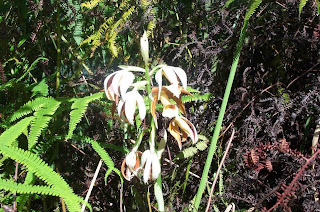 We continued up Mt Tambu, every now and then turning back to feast our eyes upon the panorama that continued to unfold, as well as the magnificent flora and fauna. Hornbills and prized black cockatoos flew across the afternoon sky – a welcome sight for our sore bodies. 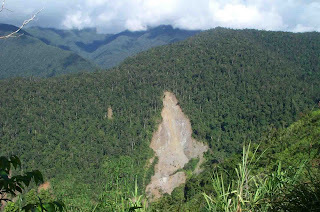 Wild pigs, cassowaries, cuscus, tree kangaroos, and other wildlife are profuse in these mountains of Salamaua. We reached the top of Mt Tambu at about 6pm and continued on to a mountain spring, in which we all washed and quenched our thirst, before descending to the hamlet of “Niukamp” (New Camp). We had dinner of bananas, rice, tinned meat, and hot cups of coffee before resting our tired bodies. Wednesday July 23, 2003 – Remembrance Day – is a day that I’ll always treasure as I firmly believe our small group honored the 60th Anniversary of Salamaua in its true spirit by trekking the Black Cat Trail. Our thoughts were with the many soldiers and carriers of WW11 who lost their lives on this treacherous path in 1942 and 1943. 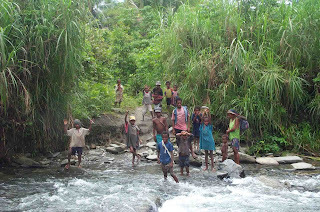 We were up early that morning, while the rest of PNG was probably still in bed, and descended down Guisep Creek, and made numerous creek and river crossings before arriving at Mubo. From Mubo, we precariously edged our way past steep cliff faces as the flooded Bitoi River raged below, to an easier crossing further upstream. We passed through a network of gardens, pebbly fords and steep jungle scrambles past landslides and difficult sections of the river before climbing up the steep ascent to the fortress- like village of Gaudagasul. The villagers – who only have visitors once in a blue moon - welcomed us with open arms and literally stuffed us with food. There were dishes of bananas, kaukau, taro, tapioca, and choko to go down with our rice and Diana tuna. After that, we talked well into the night, encouraging the locals to start building village-style guesthouses for trekkers who would pass through their village. The response was very encouraging. 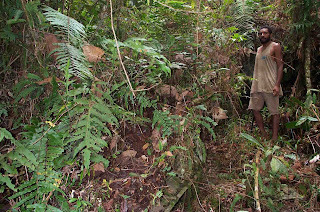 We pressed on the next morning through thick rainforest as the track steepened and deteriorated markedly. My bulk and weight of the backpack on my shoulders caused the track to give way in many places, and on more than one occasion, I had to grapple on to salat – stinging nettles – for dear life. We continued like this, scrambling down to creeks, back up again, over and around slippery log falls, landslides, and salat. On several occasions, we heard the calls of bird of paradise, which tantalisingly weaved their way through the forest canopy. Wildlife was in abundance and the forest was alive with raucous calls of other unseen birds. One time, as I was climbing up a creek, I almost put my hand on to a brown snake which Lionel and Solomon later told me was poisonous. Suddenly, Lionel gave out a yell, thinking that a snake had bitten him. After close inspection, no, but it was a leech. Thus marked our entry into leech country. The insidious creatures crawled on the forest floor like tiny dragons, and once they sniffed out blood, clung on to our legs and sucked until fattened. Shoes and socks were no hindrance as they worked their way in and continued in the same vein as miniature vampires. Lionel and Solomon, who walked barefoot, had their feet absolutely devoured by the slimy leeches. Every now and then, we had to stop, and scrape the leeches off with knives. The leeches, however, were a blessing in disguise as they forced us to pick up the pace despite the heavy backpacks on our shoulders. Many a time, I felt like opening my backpack and throwing all my wet clothes into the bush, as they were the ones really adding on extra kilos. We persevered, and after eight hours of torture, came to a kunai clearing which marked our entrance to Skin Diwai. We could push our weary bodies no more, and literally collapsed in a heap at Skin Diwai. In June 2003, three British backpackers dared to try the Black Cat, and two of them ended up very sick at Skin Diwai from either malaria, pneumonia, exhaustion, or a combination of all three. The third Pommie continued on to Biaweng village and eventually, Wau, where he managed to get a helicopter to come and ferry out his two sick buddies. Skin Diwai is a detour from the main Black Cat Trail – which continues on to Bitoi and eventually Wandumi village outside Wau - and is now the preferred choice of locals. Skin Diwai was the site of a major Australian base during WW11 and is littered with live bombs, ammunition, other war junk including boots, and even the wreckage. Being one of the high points between Salamaua and Wau, Skin Diwai is freezing cold, and we slept as close to the fire as possible that night. Keen to hit Wau the next day, come rain or sun, we were up at the crack of dawn and started walking at 6am on Friday, July 25. Like the previous day, this was a walk through leech-infested country, slippery logs and rocks, as well as numerous other obstacles straight out of a commando-training manual. We pushed our bodies to the max and at 1pm, after seven hours of hellish jungle, we descended into kunai country and were rewarded with our first glimpse of Wau. “Wau! Wow!” went through my mind as I glimpsed down on this famous gold mining township. We went down the roller coaster path to Biaweng village over the next two hours, sliding all the way down a graded track from the mining and WW11 days. Despite our sheer exhaustion, we all felt a sense of achievement, and celebrated with cans of Coca -Cola and from the village trade store. An early night, and at 5am on Saturday, July 26, we started walking to Wau which we finally arrived in at 8am. 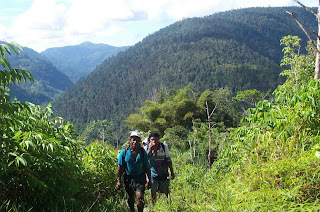 From Wau, a PMV ride to Bulolo, and another to Lae where Lionel, Solomon, Heni, and myself celebrated with a barbeque and a couple of cold beers before I departed at the crack of dawn the next day for my flight back to Port Moresby. Malum, I did the track in the opposite direction with three other expats back during the Whitsun weekend in 1972 when I was 28. Two of the party were Australian army personnel who had seen action in Vietnam and Borneo and freely admitted that the Black Cat was the toughest terrain they had seen. Your account brings back happy memories, especially of the friendship and kindness of the villagers. And the leeches and the kunai and the sore feet and the beautiful scenery. Good to hear Roger. Am planning to do the Black Ct with local MP Sam Basil next year. I just download this page.. I hope its interesting.. I'll come for more if its interesting.. Thanks. I did this walk in 1974/5 when I was 16 or 17 with my younger brother, Michael (14), James Middleton (14) and one of Leah boys (approx the same age I think).....my father drove us from Banz in the WHP to Wau where we commenced the walk. To say we didn't really comprehend what we were getting ourselves into would be an understatement...particulalry as we weren't with adults - just us and the local guides (who we paid 10 kina for the whole trip - looking back on it now I would pay them 100 times that) Utterly exhausted when we got to Salamaua and not entirely sure how we survived it. Would like to do it again, but am certain I wouldn't survive it a second time.